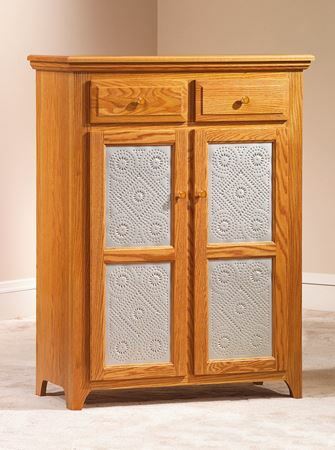 We have an extensive collection of customizable Amish dining room and kitchen furniture for sale. 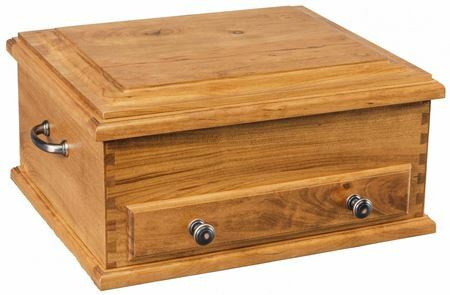 All of the wares produced by our craftsmen are made of high-quality woods, such as oak, cherry, and maple, and are built to last for generations. 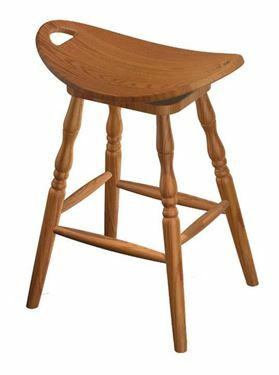 Among our Amish kitchen furniture collection are such items as solid wood paper towel holders, veggie bins, trash bins, bread boxes, and more. 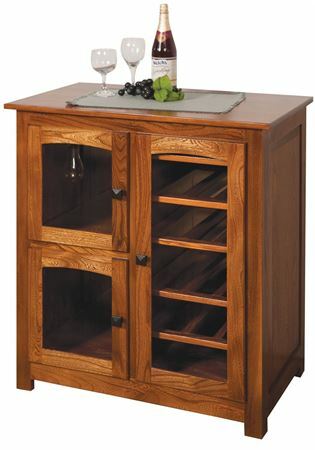 Our Amish dining room furniture includes items like grand buffets, wine racks, tables, side chairs, and lazy Susan's. 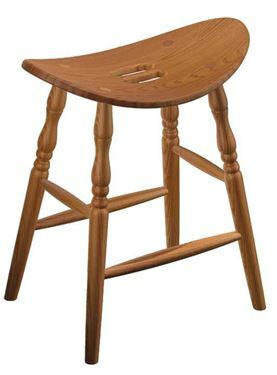 If you’re looking to give a gift that will help furnish the kitchen of a new homeowner, you can’t do better than giving them an enduring piece of Amish kitchen furniture. 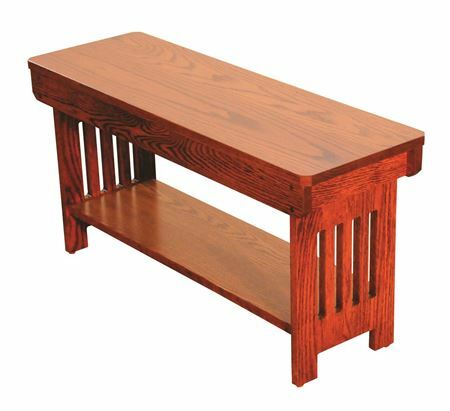 Or you might choose a piece of Amish dining room furniture, such as our grand buffet table, that can become an heirloom passed down to future generations. 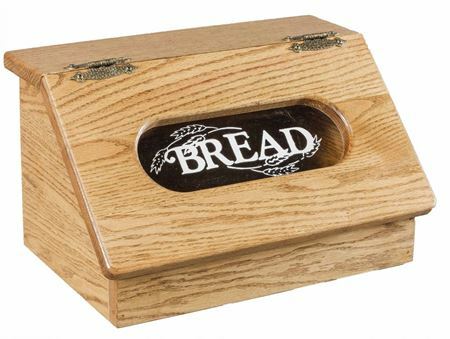 This particular Bread Box measures 9" tall, 16" wide and 11 1/2" deep. 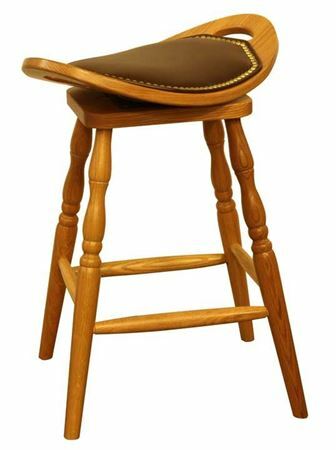 It is available in a solid color, where both top and bottom are same stain color, or a "2-tone" where the top is a different stain than the body. 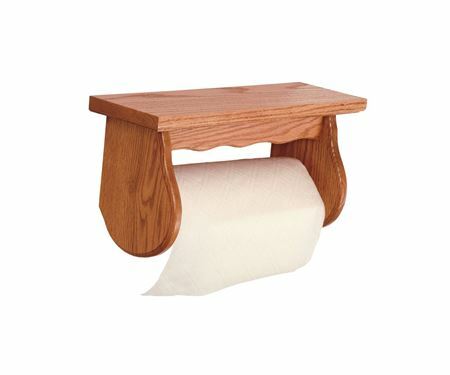 Also, available in a "Rustic" style, where the stain is rubbed on the corners, and no top coat finish to give it that "old" appearance as shown here in the image at the bottom right side with a Boston stain top and a White Sand body. Heirloom quality, and just the right size for any counter top. This stemware holder is either a stand-alone item holding 8-12 stems depending on the size of the stem. 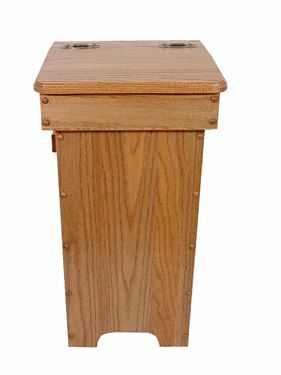 It also is designed to sit atop of the wine towers shown as an assembly. 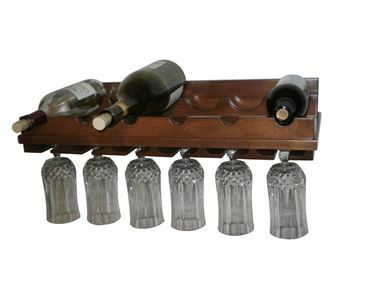 sold separately, so you may order the stemware top, and 2 of the wine bottle racks for a complete set as shown in the picture. 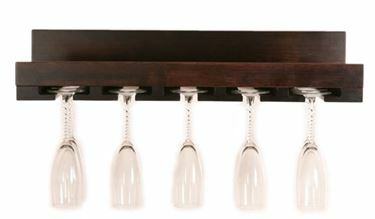 This simple but elegant Stemware rack is 25 1/4" wide, 10 3/4" deep, and 3 1/2" tall. 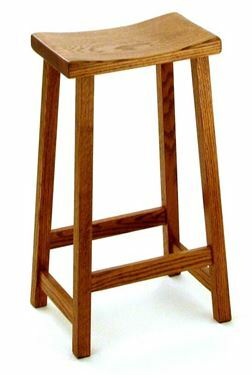 Holds 15-18 stemwares depending on their sizes, and made sturdy with 3/4" thick hardwoods that are offered. 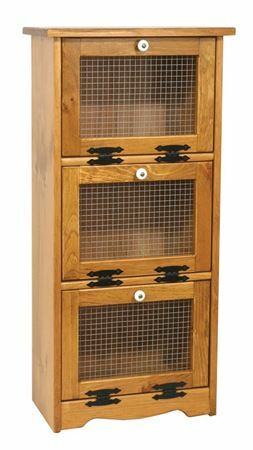 Designed for weight of wine bottles on the shelf above the stemware. Holes are spaced 16" apart to allow mounting into wall studs.Take advantage of our offer of $10 off the purchase price. Enter the discount code 72016 into the discount code box in the shopping cart. We also frequently receive requests for different lengths and depths to accomodate space requirements, so give us a call for a custom quote at 330-949-6183. 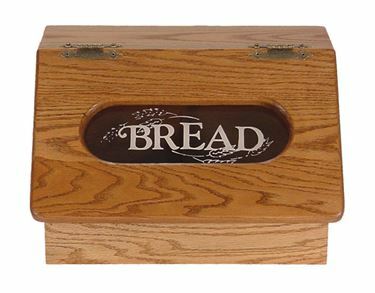 This Vintage bread box made by one of our Amish Shops is one of our favorite styles. 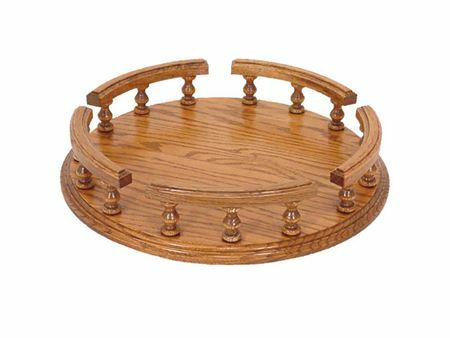 Measuring 13" tall, 19" wide and 11" deep, featuring a lid with a tin insert that really gives it the antique appearance so popular these days. 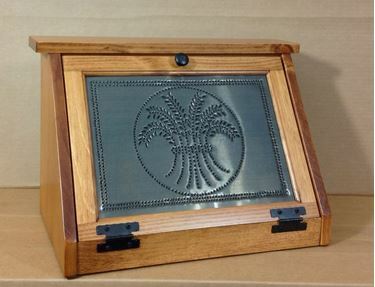 The tin inserts for the lids are available in two patterns....Wheat or Willow tree, and your choice of Copper, or a silver/gray tin color shown in a couple images to the left. 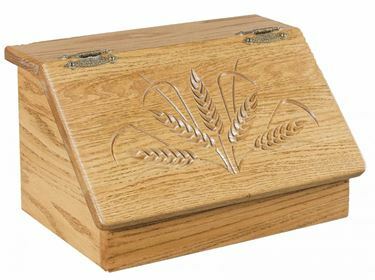 Amish made Solid Oak Bread Box with Slant Top measures 17" long 11.5" deep and 10" high. 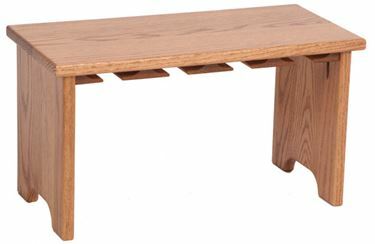 Available in Oak, Maple, Cherry, and all our Ohio Certified Stain color choices. Take advantage of our $10.00 discount for the remainder of the year by entering the discount code: 72016 into the discount box area in the shopping cart (left hand side). The discount will be taken off the purchase price. 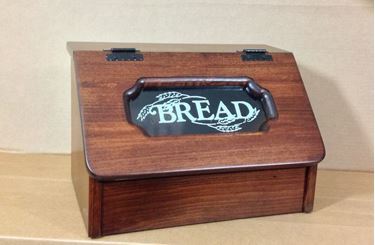 We have one of these in Maple, finished in OCS-225 Mission Maple ready to ship via Fedex today! For a limited time, take advantage of our 10% discount by entering the code: 123015 into the discount code box in the shopping cart. Designed for comfort and ease of use first, the Swivel makes getting in and out of tight places much easier than having to "scoot" out to exit...with the swivel, just rotate around, and stand up. 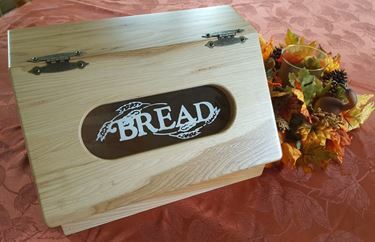 Our Amish made Hickory Bread Box measures 17" long 11.5" deep and 10" high. Choice of 2 Finishes for Hickory.....OCS-101 S-2 or Natural Clear coat to bring out the best in the natural grain patterns....shown here to the left in a Natural finish. 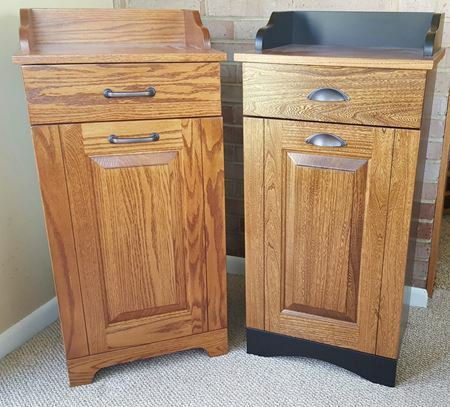 Classic Amish Style Trash bin with a hinged top. Notice the width of the apron around the top portion that is removed when emptying and replacing the liner.....wide enough to hide the plastic trash bags that so often hang out on many hinge top trash bins.